John Calder of Loveland, Ohio, is a great supporter of the ducks. 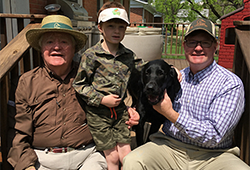 Since 1990 he has been a member of the Warren County Ducks Unlimited committee and is presently a Diamond Life Sponsor and Gold Feather Society member. John does something unique at each of the DU national convention awards dinners and most of the other DU events he attends with his wife, Joan: He is the first to raise his hand to bid on a shotgun during the live auction. Over the past five years, since attending DU's 75th national convention in Nashville, Tennessee, he has amassed quite a collection of firearms and is particularly fond of the Fausti guns he has won. John decided he wanted to leave a legacy for the ducks with a planned gift via life insurance, but because of his age and some minor health issues, he was unable to get a good rate on a new policy for himself. John sought advice from DU to determine how he could make the biggest bang for his buck for the ducks. After several visits with an insurance professional and DU staff, John decided he would open a policy in one of his grandchildren's names. "We looked at rates for his two granddaughters, ages 19 and 21; and his 45-year-old son, but their rates weren't as good as the ones for his youngest grandchild, five-year-old John K. Calder," said DU Director of Planned Giving Sarah McCallum. "John wanted to pay for the policy in full and had a required minimum distribution from his IRA coming up that he wanted to avoid paying taxes on." John transferred his required minimum distribution from his individual retirement account to DU. Ducks Unlimited then sent a check to the insurance company and paid the entire premium for the guaranteed life insurance policy. After the policy took effect, John transferred its ownership to DU and named the organization as owner and beneficiary. 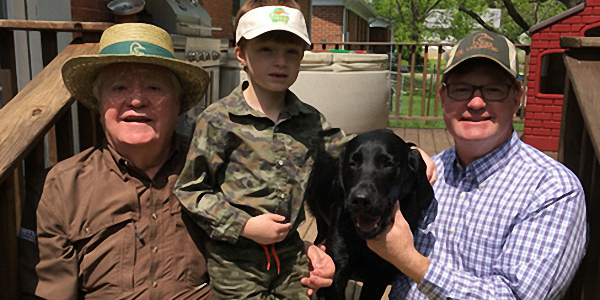 Because the policy is paid in full and his grandson's life expectancy is 85 years or more, John's legacy gift of insurance could eventually reach a value of $1.2 million which will support waterfowl conservation for generations to come. By transferring cash directly to DU from his IRA, John avoided paying taxes, added to his cumulative giving and made a substantial legacy gift at the same time, meeting his goal of "getting the best bang for the buck for the ducks". If you would like to learn more about this or other options for including DU in your estate plan, please contact us at www.ducksgifts.org.